Using kubeadm: Use a systemd drop-in to configure the CRI-O socket via --container-runtime-endpoint /var/run/crio/crio.sock"
Fedora: Available on all supported Fedora versions 28, 29 and Rawhide. CRI-O is an implementation of the Kubernetes CRI (Container Runtime Interface) to enable using OCI (Open Container Initiative) compatible runtimes. It is a lightweight alternative to using Docker as the runtime for kubernetes. It allows Kubernetes to use any OCI-compliant runtime as the container runtime for running pods. Today it supports runc and Kata Containers as the container runtimes but any OCI-conformant runtime can be plugged in principle. CRI-O supports OCI container images and can pull from any container registry. It is a lightweight alternative to using Docker, Moby or rkt as the runtime for Kubernetes. CRI-O is developed by maintainers and contributors from these companies and others. It is a community-driven, open source project. Feedback, users, and of course, contributors, are always welcome via the kubernetes-sigs/cri-o GitHub project. Kubernetes contacts the kubelet to launch a pod. 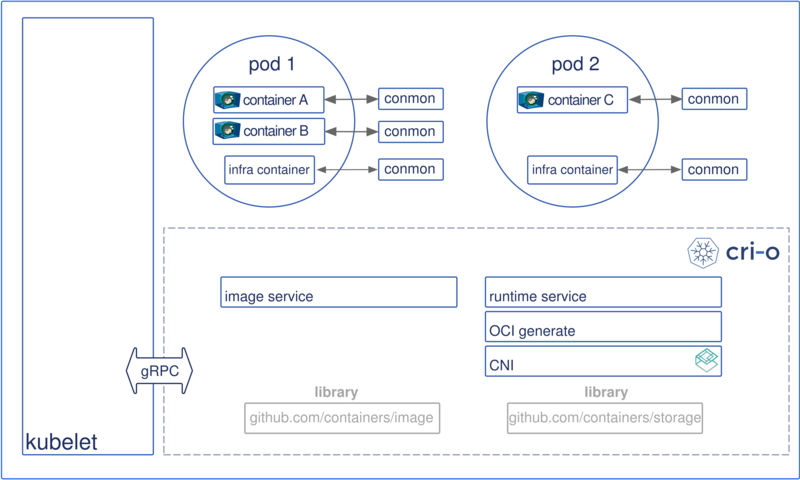 Pods are a kubernetes concept consisting of one or more containers sharing the same IPC, NET and PID namespaces and living in the same cgroup. The kubelet forwards the request to the CRI-O daemon VIA kubernetes CRI (Container runtime interface) to launch the new POD. CRI-O uses the containers/image library to pull the image from a container registry. The downloaded image is unpacked into the container’s root filesystems, stored in COW file systems, using containers/storage library. After the rootfs has been created for the container, CRI-O generates an OCI runtime specification json file describing how to run the container using the OCI Generate tools. CRI-O then launches an OCI Compatible Runtime using the specification to run the container proceses. The default OCI Runtime is runc. Each container is monitored by a separate conmon process. The conmon process holds the pty of the PID1 of the container process. It handles logging for the container and records the exit code for the container process. Networking for the pod is setup through use of CNI, so any CNI plugin can be used with CRI-O. CRI-O is made up of several components that are found in different GitHub repositories. CRI-O supports any OCI compatible runtime. We test with runc and Clear Containers today. The containers/storage library is used for managing layers and creating root file-systems for the containers in a pod: Overlayfs, devicemapper, AUFS and btrfs are implemented, with Overlayfs as the default driver. Support for network based file system images (NFS, GlusterFS, CephFS) is on the development roadmap. The containers/image library is used for pulling images from registries. Currently, it supports Docker schema 2/version 1 as well as schema 2/version 2. It also passes all Docker and Kubernetes tests. The Container Network Interface CNI is used for setting up networking for the pods. Various CNI plugins such as Flannel, Weave and OpenShift-SDN have been tested with CRI-O and are working as expected. conmon is a utility within CRI-O that is used to monitor the containers, handle logging from the container process, serve attach clients and detects Out Of Memory (OOM) situations. Container security separation policies are provided by a series of tools including SELinux, Capabilities, seccomp, and other security separation policies as specified in the OCI Specification.